Fig. 1—Different metal alloys have different atomic cell structures, such as BCC and FCC. Fig. 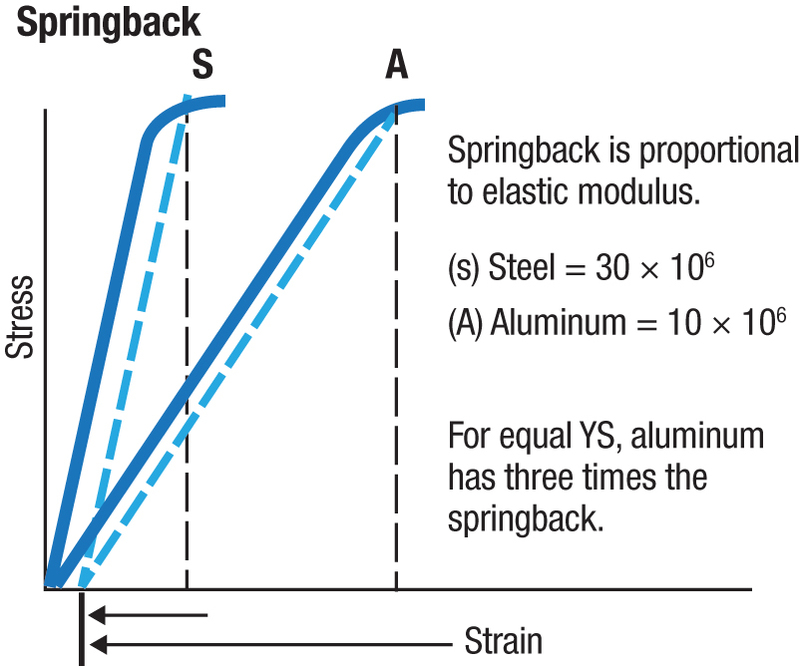 2—Steel has the highest elastic modulus and the least amount of springback. Fig. 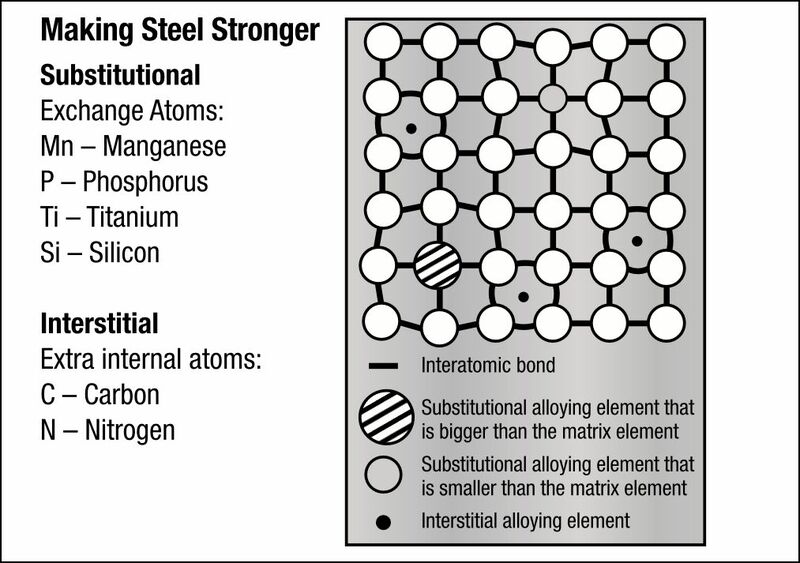 3—Atoms can be exchanged to make steel stronger at specific locations. Many in the metalforming industry assume that steelmakers insert strong items into steels to increase their strength. While true in some cases, the opposite occurs nearly all the time, for it is the microscopic atomic cell (Fig. 1) that can have the biggest impact on steel strength. The atomic cell is the cubic structure that holds the atoms in a neutral condition. If the cube is elongated in one direction, a positive elastic stress results. When the ends are released, the cell returns back to the original configuration and size. And, when compressing the atomic cell, it shrinks and creates a negative elastic stress. The atomic cell for steel is body-centered cubic (BCC), with one atom at each corner and one in the center of the cube. The cell has nine atoms. 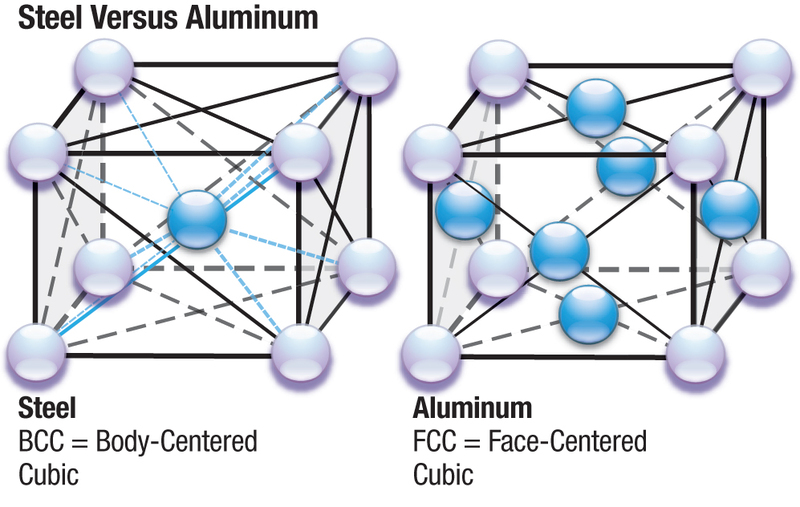 For comparison, a nonferrous-alloy cell (such as aluminum) is face-centered cubic (FCC), with an atom at each corner and one in the center of each face (Fig. 1). This cell has 14 atoms and functions similarly to a steel cell. With the BCC cell of only nine atoms, one might assume the lighter weight of BCC would be relatively weak. However, test results (Fig. 2) show that for equal yield stress, steel has three times the elastic modulus and three times less springback than alloys with FCC cells. During the steelmaking process, as the liquid steel begins to solidify the atomic cells line up in all directions to form three-dimensional steel (Fig. 3). Segments of the steel can be made stronger by exchanging different atoms. Once all the steel has solidified, the microstructure has formed. Some grains are small, some are large. Small grains will strengthen the steel—the grain boundaries intersect with neighboring grains to add strength, while the inner portion of the grains remain soft. The more grains in a given amount of space, the stronger the steel. Steelmakers seek to create a specific number of grains in the microstructure. The steelmaking industry is on the edge of complete change. Rather than insert a chunk of martensite into a grain of ferrite to create a dual-phase steel, they may add millions (maybe billions) of nano-sized particles to the steel, evenly distributed to add strength and develop other qualities.